Levi Joseph Gaskins, a son of Gideon Gaskins and Sarah “Sally” Knight, was a member of New Ramah Primitive Baptist Church, Ray City, GA. His maternal grandparents where Ann D. Clements and General Levi J. Knight, and on his father’s side were Polly Barrow and John Gaskins. 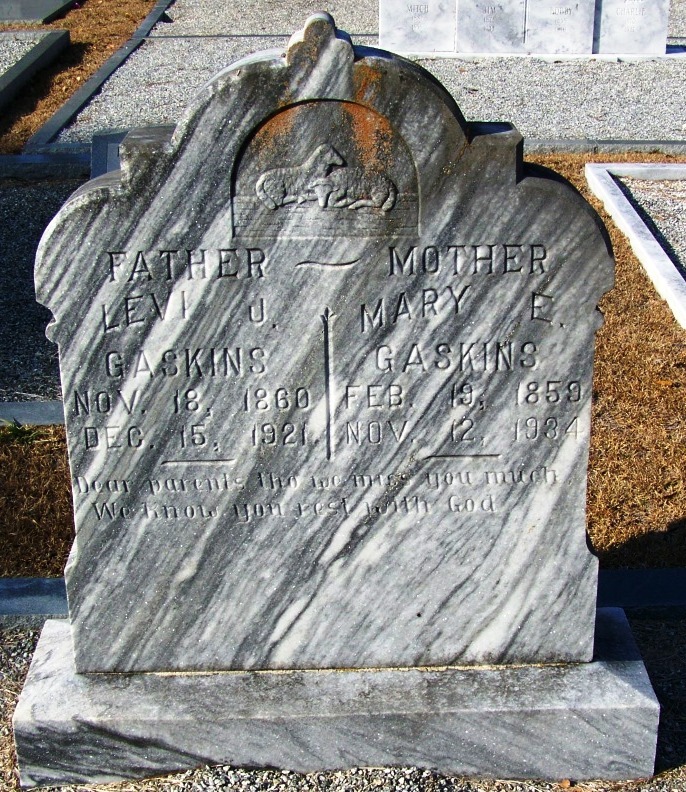 Upon his death in 1921, Levi J. Gaskins was buried at New Ramah Cemetery. It is with much sorrow and regret that we here record the death of our beloved brother Levi J. Gaskins who was born to this Life Nov. 18th, 1860 and Died Dec. 15, 1921. He together with his faithful wife united with the Church at New Ramah on Sept 7, 1916 at which place he lived to his Death. 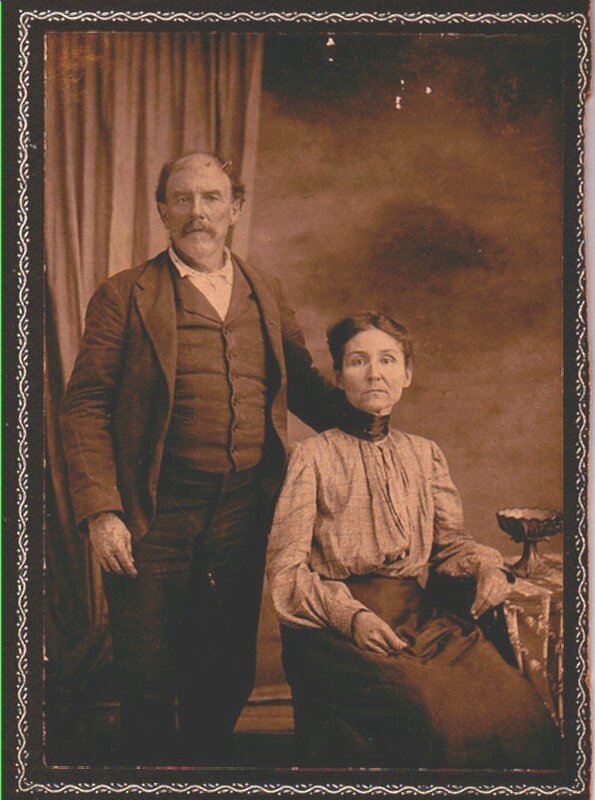 He was united in marriage to his wife who was Miss Mary Strickland Feb 24th, 1878. We can truthfully say of our beloved and departed brother that He was ever faithful kind and gentle. As a husband father and friend, and as a neighbor he was ever ready to raise the fallen and help the weak. In truth His life was as we feel the life of a Christian who is unselfish and unassuming. and we would say that we grieve not for Him as we would for one who has no Hope for we feel that our loss is His eternal gain and when the blessed Savior comes again to gather his jewels home that this dear brother will be formed and fashioned like his Glorious body and be escorted away to that Celestial City not made with hands where there will be no more sickness sorrow pain nor Death. We pray God’s greatest and richest blessings upon the berieved family Trusting that they may be able to be resigned to the will of Him who doeth all things well. 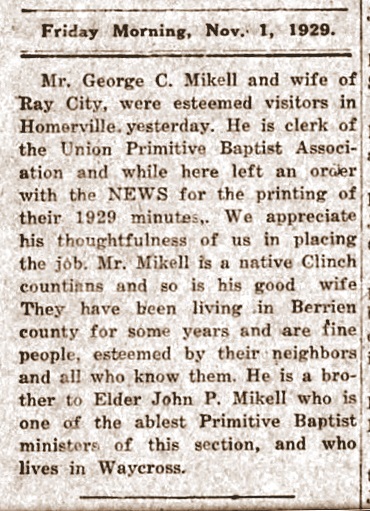 An old clipping from the Clinch County News, dated November 8, 1929 gives a brief history of the Mikell family, beginning with George Mikell who was a pioneer settler of Clinch County. Three of his grandsons, Rufus Lane Mikell, George Calhoun Mikell and Otis Willie Mikell (subject of earlier post – see Ola Crews and Otis Mikell) became residents of Ray City, GA. The news clipping, which provided in part the following information , is transcribed below. George Calhoun Mikell made Ray City his home some time before 1920. He was a Primitive Baptist and is buried at New Ramah Cemetery in Ray City. Grave marker of George Calhoun Mikell (1876-1960), New Ramah Cemetery, Ray City, Berrien County, GA.
George Calhoun Mikell was born March 4, 1876, a son of Rebecca Lee and John A. Mikell. His paternal grandparents, Rachel Roberts and George Mikell (1818-1880), are buried at Wayfare Primitive Baptist church in unmarked graves. When George was thirteen years old, he lost his father. John A. Mikell died April 9, 1889 and was buried at North Cemetery, Clinch County, GA.
George’s mother, Rebecca Lee, was a daughter of Phoebe Register and Zachariah Lee. 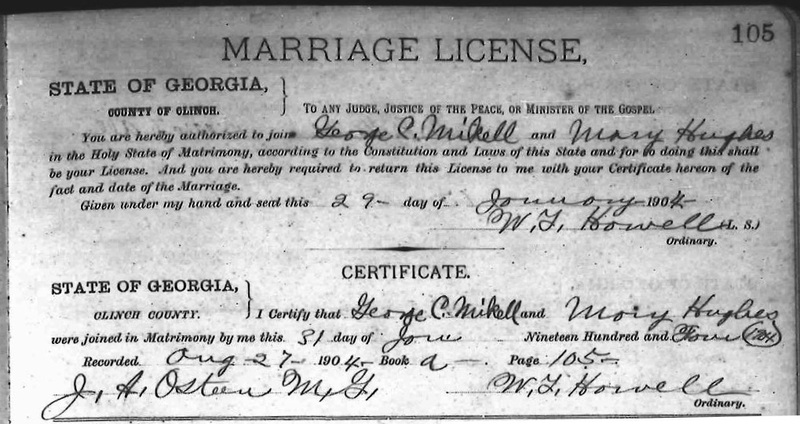 She was born November 5th, 1845 in what is now Clinch county, GA. She married John A. Mikell about 1868. Following the death of her husband in 1889 she continued to live in Clinch county where she farmed, with the help of her children, in the 1280th district . After her sister, Elizabeth Lee Fiveash, died on May 05, 1912, Rebecca Lee Mikell married her brother-in-law George Appling Fiveash (1842-1927). On the death of George Fiveash in 1927, the twice-widowed Rebecca Lee Mikell Fiveash went to live with her son, George Calhoun Mikell, at Ray City, GA. She died December 08, 1932 in Lowndes Co GA. She was buried at North Cemetery, DuPont, Clinch County, GA.
George C. Mikell married Mary Hughes on January 31, 1904, in Clinch County. She was a daughter of James H. Hughes. In the census of 1910, George C. Mikell was enumerated with his wife and son, Ollie, in the 1280 district of Clinch County. Some time after 1910 he brought his family from Clinch to Berrien County. On September 12, 1918 he registered for the draft for World War I in Nashville, GA. At age 42, he was tall and slender with blue eyes and black hair. He was a self-employed farmer with a home on Rural Free Delivery route #2 out of Nashville. By the time of the 1920 census, the Mikells were living on a farm near Ray City on the Nashville Road. The 1930 census shows George and Mary still farming at Ray City, George’s mother living in their household. His mother died in 1932, and was buried with her first husband at Wayfare Primitive Baptist Church in Clinch County. 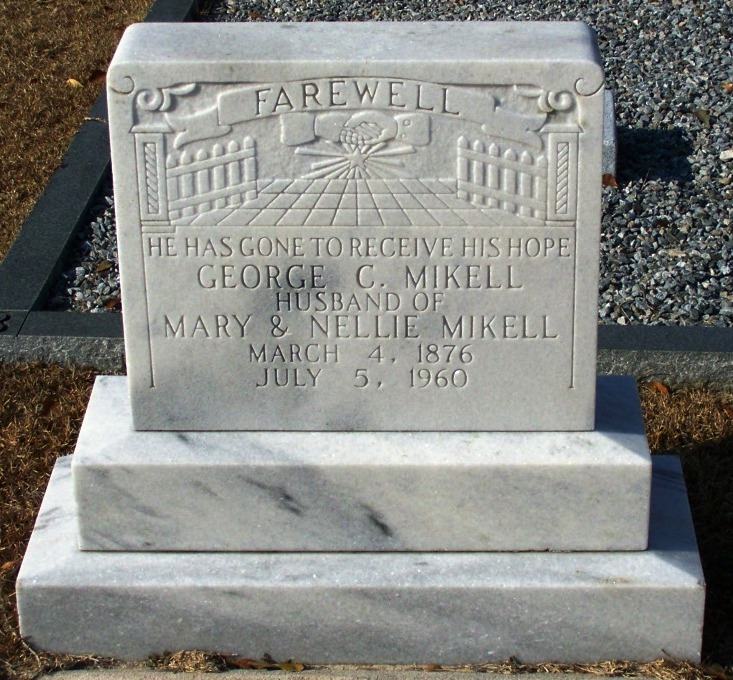 George’s wife, Mary Mikell died April 25, 1939 and was buried at New Ramah Cemetery, Ray City, GA. Later he remarried, taking Nellie Hughes, daughter of John Jasper Hughes, as his second wife. When George C. Mikell passed in 1960, he was buried at New Ramah Cemetery next to his first wife. George Mikell, an old pioneer citizen of Clinch county, came to this section from Bulloch county, and settled in what is now Echols county where he married. Later he moved to a point near Dupont and spent the remainder of his life there. He was born in Bulloch county in 1816, and died about 1880. His wife was Rachel Roberts; she was born in 1830, but we have not learned who her parents were but we infer she was a daughter of John Roberts who also came to this section from Bulloch county. 1. John A. Mikell who married Rebecca Lee. 2. Sarah who married Mark or S. M. Bennet. 3. Bettie or Elizabeth who married Samuel Tomlinson. George Mikell and his wife were members of Wayfare Primitive Baptist church, and are buried there. Their graves are not marked. George Mikell had two brothers, Bob and Charles. The former lived in Wayne county and the latter moved to Florida. 1. Ardelia who married Moses Pittman, living at Arcadia, Fla.
2. Alice who married Roland Zeigler. 3. Rufus L. who married ollie Morgan, daughter of Granville Morgan. 4. Charlton Z. who married Mrs. Lula Crews. 5. George C. who married Mary, daughter of James H. Hughes. 6. Perry C. who married Bessie Powell; living at Quitman. 7. Phoebe who married R. A. Dasher and lived near Bemiss. 8. John P. who married Sallie, daughter of George Corbitt of Echols county. 9. Otis W. who married Ola Crews. 10. Augustus T. married Annie Wilkerson of Berrien county. He is the only one of the ten children not living. John A. Mikell was baptized July 5, 1883 into the membership of the Primitive Baptist church, and on Dec 1, 1883 was dismissed by letter and united with Olive Leaf church near Dupont. Mr. Mikell served as deputy sheriff under Sheriff J. M. Jeffords who sheriff from 1881 to 1887. He was elected justice of the peace of the 1280 district, commissioned January 24, 1881, serving two terms of four years each, his last term expiring just before his death. John P. Mikell and his brother Geo. C. have both become leading members of the Primitive Baptist denomination in this section, one a layman and the other a minister; one adhering to the “old-line” association and the other to what is called the “Peace Movement” association of the the old Union Association. Elder John P. Mikell as a preacher is known far and wide for his gifts and influence as a Christian worker, and his brother George is making his association a capable clerk and as a layman is known and loved for his upright Christian life. Alexander Mikell and Rebecca Hollingsworth, Dec 7, 1804. Charles Mikell and Dicy Lee, Dec 17, 1804. Thomas Mikell and Mary Row, April 3l 1805. John Mikell and Hannah Stuart, Aug. 6, 1805. Thomas Mikell and Mary Woodcock, Nov. 10, 1807. William Mikell and Mary Anderson, Nov 21, 1809. John Mikell and Catherine Lowther, Feb. 8, 1826. John Mikell, an old citizen of Bulloch county, died in 1799, and his estate was administered by his widow Elizabeth, and Edward Mikell. They were appointed administrators Feb. 10, 1800. Their bond was for $20,000 and signed by Sherod McCall and James Mikell. The estate was appraised in 1800 by Stephen Denmark and John Rawls and Jesse Mixon, and valued at $8099.75. Among the property enumerated were 13 slaves and $3500 worth of cattle. A petition for division of the estate was filed by the widow in May, 1803, and the Court granted partitioners to divide the land, and among these were George Mikell, James Mikell, Sr., and James Mikell, Jr. In a sales account filed by the administrators in May 1803, Sarah Mikell, Francis Mikell and James Mikell were mentioned as younger heirs. In March, 1807, the administrators were required to show cause why they had not made any return. Further than this we did not find out about this estate. It seemed to be the only Mikell estate administered in Bulloch prior to 1820. Mary Elizabeth Clance and William Henry Mixon came to Ray City, GA some time around 1901 and made it their home for the remainder of their lives. 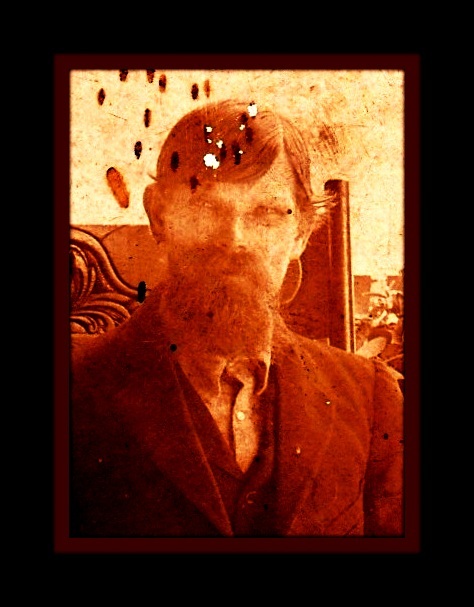 William Henry Mixon was born November 27, 1854 in Marion County, GA. He was a son of Drucilla Balcom and James Michael Mixon. His grandfather was Michael Mixon (1794-1838), believed to have been killed in Lowndes County, GA while fighting in the Indian Wars in 1838. 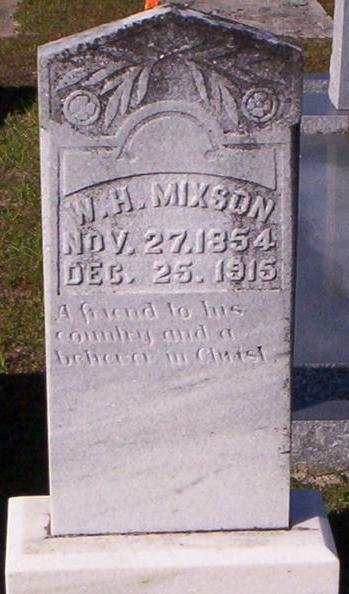 William’s father, James Michael Mixon (1830-1911), was a Confederate veteran who was wounded during the Civil War. William’s parents separated after the Civil War, and William moved with his father to Twiggs County, GA to the home of his great-grandmother, Sena Mixon. When William’s father moved on to Pulaski County, William stayed behind in Twiggs County. It appears that around 1874, William’s father moved with his second wife, Amanda Smith, and their minor children from Pulaski County, GA to Lowndes County. In the census of 1900, James M. Mixon was enumerated in the Rays Mill district of Berrien County, Georgia Militia District 1144. According to census records William Henry Mixon married Mary I. Clance about 1880 in Twiggs County, GA. His occupation in 1880 was working as a miller at a grist mill. Mary Clance was a daughter of Mary L. Blaylock and Wiley Clance. Her father once served as Justice of the Peace for Twiggs County, GA, and was also a wounded Confederate veteran. Annie Bell Mixon: born Jun 1882 in Wilkinson County, Georgia; married William Carl Griner on 17 Jan 1904; died 1917 in Ray City, Berrien County, Georgia. Hattie Leona Mixon: born June 1886 in Wilkinson County GA; married Lee Knox (son of Alton Knox) on 14 Dec 1904 in Berrien County, GA; died 29 Oct 1963 in Colquitt, Georgia. Mary Lee “Mamie” Mixon: born 1 Jan 1890 in Wilkinson County, GA; married Joseph John “Joe” Spells on 15 Jul 1917 in Berrien County, Georgia; died 29 Jul 1926 in Ray City, Berrien, Georgia; buried at Beaver Dam Cemetery, Ray City, Georgia. Ida Mae Mixon: born 12 Feb 1893 in Wilkinson County, GA; married Joseph Browning about 1921 in Clinch County, GA; died 18 Jun 1980 in Lanier County, GA; buried at Fender Cemetery, Lakeland, Lanier, Georgia. Ethel “Effie” Pearl Mixon; born in Wilkinson County, Georgia on 11 Sep 1899; married Joseph “Leroy” Brown on 25 Aug 1927; died 28 Nov 1984 in Lakeland, Lanier, Georgia; and buried at Beaver Dam Cemetery, Ray City, Berrien, Georgia. Alva Lorine Mixon: born 25 Mar 1895 in Wilkinson County, GA; married Thomas Henry Kirk about 1910, died 23 Jan 1977 in Lake Worth, Florida. Samuel E. “Sammie” Mixon; born 7 Jun 1898 in Wilkinson County, Georgia; died of pneumonia 19 Oct 1918 while serving in France during WWI; buried at Beaver Dam Cemetery, Ray City, Berrien, Georgia. divorced; died 10 Aug 1991 in Columbus, GA; buried at Fender Cemetery, Lakeland, Lanier County, Georgia. Bessie Mixon: born 9 Jun 1906 at Nashville, Georgia; died 11 Jul 1908; buried between her parents at Beaver Dam Cemetery, Ray City, Georgia. Grave marker of William Henry Mixon, Beaver Dam Cemetery, Ray City, GA.
After the death of William Henry Mixon, his widow, Mary Clance Mixon, married Henry Thomas Cersey. When she died in 1948, she was buried near her first husband at Beaver Dam Cemetery, Ray City, GA.
Mrs. Mary Cersey, 83, Died last Saturday; Final Rites Monday Mrs. Mary Cersey, lifetime resident of Berrien County, died in a Hahira Hospital Saturday afternoon after a long illness. 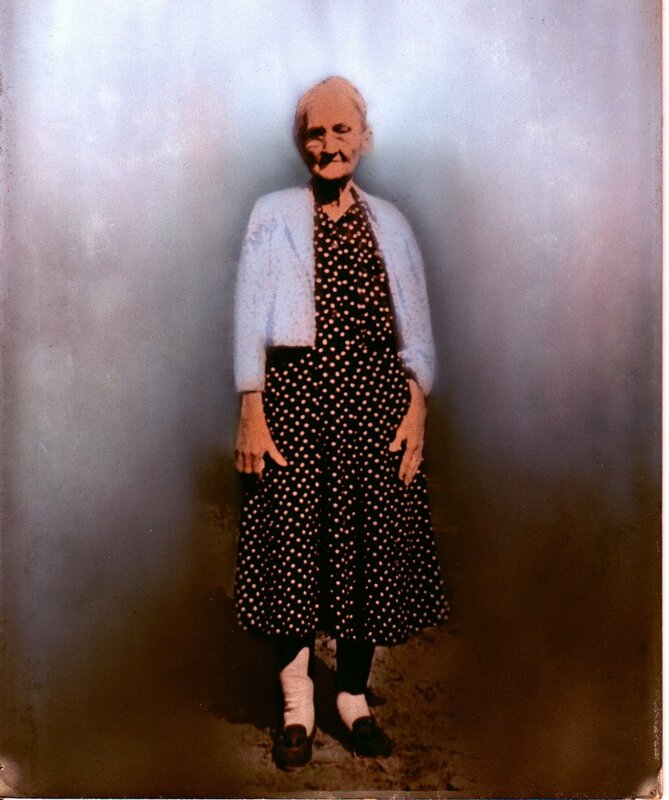 A resident of Ray City, she was 83 years of age, having been born in Wilkerson County on May 26, 1863. Mrs. Cersey is survived by five daughters, Mrs. Lee Macks, Moultrie; Mrs. Joseph Browning, Ray City; Mrs. Oliver L. Kirk, Lakewood, Fla; Mrs. Effie Brown, Ray City; and Mrs. Lonnie Royals, Stockton; two sisters, Mrs. J. E. Kitchens and Mrs. J. W. Coleman, Wintergreen, Fla; 20 grandchildern, and 36 great-grandchildren. Funeral services were conducted Monday afternoon at 3 o’clock at Beaver Dam Primitive Baptist church by Elder C. H. Vickers and Elder M. E. Peavy. Interment was in the church cemetery at Ray City. Active pallbearers were D. J. Skinner, J. T. Richardson, G. B. McLendon, B. J. Akridge, O. V. Conner, and M. W. McLendon, Honorary pallbearers were G. G. Mikell, O. W. Mikell, B. F. Skinner and J. J. Spell. A selected choir sang Primitive hymns. NOTE: Beaver Dam church (now known as Ray City Baptist Church) was not Primitive Baptist. The Primitive Baptist church in Ray City was New Ramah Church. Charlie Vickers and Marcus Peavey were pastors at New Ramah. 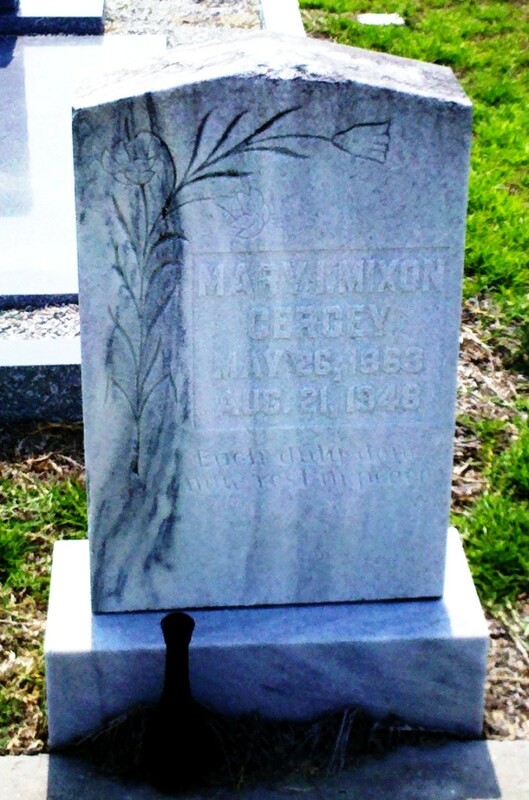 Grave marker of Mary I. Mixon Cersey, Beaver Dam Cemetery, Ray City, GA.
New Ramah Primitive Baptist Church, at Ray City, GA, was built on land donated by Elias M “Hun” Knight, John T. “Coot” Knight, Alexander “Bub” Knight, and Levi Jackson Knight, the four sons of Sarah “Sallie” Moore and Henry Harrison Knight, and grandsons of pioneer settler John Knight. The land for the church and cemetery was donated by A.S. Knight, E.M. Knight, L.J. Knight, and John Knight, all sons of Henry H. Knight. On August 30, 1913 the following brethren met and established the new church: Elder I.A. Wetherington, Unity Church; Elder H.W. Parrish, Salem Church; Elder A.A. Knight, Pleasant Church; Elder E.R. Rhoden, Pleasant Hill; and Elder Ed Lindsey, Ty Ty Church. Public donations from twenty-five cents on upwards to thirty-five dollars were given to build the church. Elder A.A. Knight was the first pastor and served for twelve years from August 1913 until July 1925. He was the father of June Knight, Mrs. Martha Burkhalter, and Mrs. J.L. Lee, all former residents of the community. Elder C.H. Vickers succeeded Elder Knight and he served as pastor until December 1970, having served continuously for almost 45 years. Serving shorter terms as pastor were Elder J.R. Stallings from January 1971 to January 1972; and Elder Elisha Roberts from January 1972 until August 1973. The present pastor, Marcus Peavy, began his pastorate in August 1973. Brethren who have served the church as clerks are George Mikell, Terrell Richardson, Lloyd Cribb and the present clerk, Austin Register. There are presently eighteen members of the church.